In 1959, the Brown siblings were the biggest thing in country music. Their inimitable harmony would give rise to the polished sound of the multibillion dollar country-music industry we know today. But when the bonds of family began to fray, the flame of their celebrity proved as brilliant as it was fleeting. Masterfully jumping between the Browns’ once-auspicious past and the heartbreaking present, Nashville Chrome is the richly imagined story of a forgotten family and an unflinching portrait of an era in American music. In his “breath-catching, mythic and profoundly American tale of creation, destruction and renewal” (Kansas City Star), Rick Bass mines quiet truths and draws poignant portraits of lives lived both in and out of the limelight. Rick Bass’s fiction has received O. Henry Awards, numerous Pushcart Prizes, awards from the Texas Institute of Letters, fellowships from the National Endowment for the Arts and the Guggenheim Foundation, among others. Most recently, his memoir Why I Came West was a finalist for a National Book Critics Circle Award. Nashville Chrome is a fictionalized biography of the Brown family. When you were reading the book, were you more aware of the book as a novel or as biography? Do you read those two genres differently? What do you think are the difficulties for an author in writing such a book? In the book’s acknowledgments, the author states, “[The Browns] are not perfect—no more, and no less than anyone else—but it might well serve a reader interested in the delineations between novelistic excess and ‘regular’ life to review anything distasteful or negative in these pages as only an exercise of the novelist’s imagination and the story’s craft, rather than true-life revelation of flaws or failings in the Browns or their family.” What do you think of this disclaimer? The book’s epigraph, from Cormac McCarthy’s All the Pretty Horses, is about the effects that place has on the people who grow up there. How did “the weathers and seasons that form a land form also the inner fortunes” of the Browns? In other words, what kind of place was Poplar Creek, Arkansas? How were the Browns shaped by that area? To what does the title of the book refer? What aspects of the Browns’ music—and of their lives—does the title reflect? What other stories (books,films, etc.) can you think of that follow the trajectory of fame over the course of a life? How does Nashville Chrome compare? If it is a familiar narrative, why do you think that is? 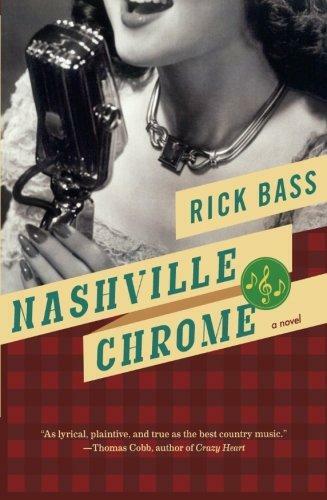 Nashville Chrome is the story of a family that has an unusual gift—a gift that was unasked-for, unearned. What sort of responsibility do we have to a talent, a skill, even just a potential, if it’s not something we’ve asked for? Do people with a particular potential “owe” it to the world to develop it, even at the expense of other parts of their lives? Would you feel differently about someone whose gift is a beautiful voice than you would about someone whose gift could be the skilled hands of a surgeon, or the mathematical mind to solve important scientific problems? The Browns’ success was as a trio, not as individuals. What happens when this group, this family, starts to atomize into a collection of individuals? The source of the Browns’ fame is continually questioned throughout the book. Was it fate that they would become famous? Was it a choice? Did they make it happen, or did they step into roles that were already provided? Do you think these questions make a difference to how the characters thought about their lives? Why or why not? Do you ask yourself these questions about your own life? When, as early performers, they sign on with the deceitful agent Fabor, we’re told that “he owned them.” How was he able to manipulate them? Are artists today more in control of their careers? What role does Elvis play in the novel? Is he one of them? Did he exploit them? How was his fame different from theirs? “The thing that had made the Browns so revered—the ability to tamp down any unrest and present a smooth surface—would ultimately be their weakness, but they would be the last to know it” (p. 105). How was this true? In what ways do we get a sense of history in this book? How does the backdrop of American culture at large affect the Browns’ story? What sense do you get of generations in the novel? Who did the Browns supplant in the country music hierarchy? Who supplanted them? Maxine, as an old woman, is continually looking for recognition, respect, and an audience. As an early crossover country artist, she feels that the superstar country singers of today owe her a debt. But what do we owe our artistic forbears? Is it important to pay tribute to artists of an earlier generation, or would the gains they made have been made, eventually, by others? Maxine’s obsession with her own fame hurts her: “the world was no longer looking at her, and in her panic at that observation, she failed to behold the world” (p. 176). How else has fame, and the loss of it, hurt Maxine? Why is she different than her other siblings? When Maxine decides she wants someone to make a film of her life, what she gets isn’t quite what she’d expected. How does the young Jefferson Eads help her achieve what she wants? How does she help Jefferson? What is the difference between Maxine’s art and Jefferson’s art?